In the first installment of this Research to Application series (Cues, Triggers, and Nudges), we introduced you to research from Charles Duhigg’s book The Power of Habit1 and how organizations and practitioners can use this research to improve the effectiveness of a service, workshop, or program for fathers. In discussing the role of cues, we described the research Duhigg highlights on the power of habits and the role they play in our lives. This installment focuses on another important aspect of the research Duhigg highlights: the concept of keystone habits. These are the habits that matter more than others in changing unhealthy behaviors or developing healthy ones. As you can imagine, keystone habits are very important as they relate to father absence and encouraging father involvement… more on that soon. But let’s begin by sharing one of Duhigg’s diverse examples of keystone habits and their importance in triggering a cascade of change: integrating exercise. Yes. They even become more financially responsible, at least in a specific way. That kind of change might seem odd until you realize that exercise has a spillover or cascade effect that triggers other healthy habits because it makes other habits easier. Think of the power of exercise as the first domino in a domino structure that, when pushed into the next domino, triggers all the other dominos to fall one by one. Similarly, the power of exercise is not only in its ability to help people lose weight and become more fit; its power is also in its ability to start widespread, positive change in people’s lives—even in areas that seem unrelated to physical fitness. The power of keystone habits explains why being an involved father is so powerful. Father involvement is a keystone habit. (Actually, a set of habits that form a keystone habit.) That’s why father involvement affects so many areas of fathers’ lives and the lives of children, mothers, and families, and even the environment in communities. When fathers are involved in the lives of their children, it triggers positive behavior in other aspects of fathers’ lives (e.g. they engage in healthier behavior), children’s lives (e.g. they are less likely to abuse alcohol and drugs), and mothers’ lives (e.g. they are healthier during their pregnancies). It’s also why it positively affects our society (e.g. lower levels of poverty and child abuse and more educational success for children). It’s why more resources must be focused on addressing the crisis of father absence. When it comes to working with fathers individually or in groups, you can use the power of keystone habits to help fathers identify the habits (behaviors) unique to them that: 1) trigger a lack of father involvement, and 2) will trigger greater father involvement. 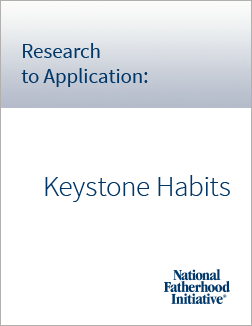 (You can also use keystone habits to look for clues that will improve father-mother relationships.) It’s likely that a single habit will contribute to a lack of father involvement or trigger more father involvement (moreover, it’s likely to be a group of habits.) Nevertheless, one or two of those habits might be more important than the others, thus revealing an area(s) of focus for immediate change. Step 1: Develop a comprehensive list of frequent/regular activities/behaviors. Identify the “universe” of frequent/regular activities/behaviors that fathers currently engage in. Ask fathers to write or tell you (and you record) their activities/behaviors during a typical week. Consider using the structure of roles in which to group activities, such as father, husband/partner, worker/employee, friend, etc. You could start by asking fathers the roles they have, and then ask them to list the activities they engage in each week to perform those roles. After fathers develop their weekly activities, ask if they perform activities less frequently (e.g. monthly), but that they do consistently, to ensure you get a comprehensive list. Step 2: Identify existing keystone habits that promote father absence. Look for keystone habits that encourage or lead to father absence. Focus on habits that are within his control. Ask of each father: What do you do with such frequency that it prevents you from being present? After you identify those habits, ask: How can you eliminate them? Work with fathers to develop tactics to eliminate these poor habits. It might not be easy, but it will be worth it. Step 3: Identify existing and potential keystone habits that promote father involvement. Look for keystone habits that encourage or lead to father involvement.Again, focus on habits that are within his control. Step 4: Focus on small wins. After fathers develop their list of potential keystone habits that promote father involvement, narrow that list down by focusing on habits that fathers can do easily and frequently before tackling habits that are harder to accomplish and that, even if easy to accomplish, they can’t do as frequently. Why is this focus so important? Because it creates small wins that fathers experience often/repeatedly. While they might seem minor in the broad scheme of things, they build a foundation of confidence, especially in fathers who haven’t been successful at being involved. Step 5: Reinforce/praise the small wins. When fathers achieve small wins, praise fathers. This praise will help keystone habits snowball into the other habits of involvement the habits will affect. In other words, praise helps tip the keystone habits—the first dominoes—into the other habits. Watch them fall one by one! Depending on your situation and how much time you have to work with fathers, it might not be possible to focus on keystone habits that both encourage and discourage father involvement at the same time. At the very least, address keystone habits that encourage father involvement. For users of NFI’s 24/7 Dad® A.M and P.M programs, the My 24/7 Dad® Checklist new to the 3rd Editions is an ideal tool for fathers to use to apply keystone habits. In fact, these should be the most important checklist items. In addition, NFI’s 24/7 Dad® To Go Android application (app) is an ideal tool that allows fathers to create to-do lists, and would be a great place for fathers to integrate keystone habits (download the app for free from the Google Play Store.) Having a checklist provides fathers with clear direction around what they should do on a regular basis to be involved. They can modify and add to their items (habits) as they become more involved, and want to tackle more challenging (but important) habits of an involved, responsible, committed father. Regardless of how you apply keystone habits, approach your effort as an experiment. Keep track of what works with fathers in general and with specific kinds of fathers (e.g. custodial and non-custodial) so that you can apply what works in future work with fathers one-on-one or in groups, and avoid what doesn’t work. The book The Power of Habit: Why We Do What We Do in Life and Business by Charles Duhigg. The 7 Habits of Highly Effective People by Stephen Covey. The habits in this book are ideal for fathers to integrate as they become more involved. Indeed, NFI develop a workshop called The 7 Habits of a 24/7 Dad™ that you should consider offering to the fathers you serve. Visit www.fathersource.org to learn more. 2) Research to Application > Framing and the "No Choice Option"
1) Duhigg, C. (2012). The Power of Habit: Why We Do What We Do in Life and Business. New York, NY: Random House. As the nation’s #1 provider of fatherhood skill-building programs and resources, NFI provides guidance for practitioners and organizations on how they might be able to use to use the latest research on human behavior to enhance the effectiveness of their work with fathers. NFI provides this guidance in a series of blog posts called Research to Application: Guidance for Practitioners and Programs. The series offers a platform for generating dialogue among NFI, organizations, and practitioners on ways that research can be applied to addressing pain points in serving fathers. This post is the fifth one in the series. It provides ideas on how you might integrate research on keystone habits. Integrating this research could make it easier for you to help fathers to identify the most significant barriers that keep them from being as involved in their children’s lives as they’d like to be. It could also help fathers develop the habits of good fathering above and beyond reliance on the resources (e.g. programs/curricula) you might currently use.